I mentioned in my post yesterday that I purchased a piece of art! How did I find something that met these criteria? Diligence! I have scoured my sources almost daily. Where did I look? All over. 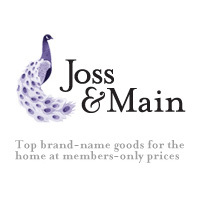 Mainly I looked at two sites that specialize in high end design items at discounted prices: One King’s Lane and Joss and Main. They feature new items every day, but items are only available for a limited time and are subject to availability (you have to pounce when you like something!). To use these sites, simply create a username and password, then shop to your heart’s desire. They sell everything from candles to consoles during their sale events. During my search, I saw a wide variety of artwork. There are always a few posters and canvas prints available, but the Vintage and Market Finds section regularly offers framed art as well. Is this not divine?! I LOVE it! Of course, I can’t afford an original piece. So this is a 36″ x 24″ canvas print. The retail price is $325, but I was able to order this gorgeous girl for around $160… a steal. The size will be perfect above our sofa and I love the neutrals tones mixed with metallic accents. What do you think of the new piece?